Welcome back. In my last blog post, Endangered Species Act Endangered, I reviewed the unending efforts to weaken the Endangered Species Act despite the American public’s broad support of the law. Compared to the efforts to prevent action on climate change, there’s one big difference. Whereas both involve lobbying elected officials, campaign contributions and the like, stopping the adoption of climate change policy has included a massive campaign to sow doubt about the science behind climate change. That campaign has had a major impact, but today, I’ll just focus on lobbying. A study by a researcher from Drexel University provided an eye-opening estimate of the money spent lobbying climate change legislation in the U.S. Congress for the years 2000 to 2016. The Drexel researcher obtained all data for his study through searches of the Open Secrets website of the Center for Responsive Politics. The 1995 Lobbying Disclosure Act requires organizations that spend money on federal lobbying to submit quarterly reports, and that information has been available on the Open Secrets website since 1998. Although there is no correspondence between a specific organization’s lobbying positions and its sector of the economy, the researcher grouped the different organizations insofar as possible by sector to provide a summary of overall climate lobbying expenditures. It’s important to note that the lobbying reports provide a conservative estimate of expenditures to influence legislative outcomes. They do not include, for example, citizens’ lobbying efforts, contacts with political representatives spending less than 20% of their time on lobbying, or activities such as mobilization of outside groups, media contacts and public relations campaigns. Nor do they include campaign contributions. U.S. climate lobbying expenditures from 2000 to 2016. Amounts shown by bars and left vertical axis, $0 to $500 million; percent of total lobbying expenditures shown by line graph and right vertical axis, 0% to 10% (from link.springer.com/article/10.1007%2Fs10584-018-2241-z). Breaking down climate lobbying by sector showed the largest expenditures were by the electrical utilities, $554 million, 26.5% of total climate lobbying expenditures; the fossil fuel sector, $370 million, 17.7%; and the transportation sector, $252 million, 12.0%. The renewable energy sector accounted for 3.8% ($79 million) and environmental organizations, 2.3% ($48 million), of the total climate lobbying expenditures, with neither exceeding 5% in any year. U.S. climate lobbying expenditures by sector, 2000 to 2016 (from link.springer.com/article/10.1007%2Fs10584-018-2241-z). Climate lobbying expenditures tended to be relatively low when control of government was divided between political parties or the party opposed to climate action was in control. When the party in favor of climate action was in control, climate lobbying expenditures increased given the likelihood that climate legislation would be enacted. As the researcher noted, climate lobbying is big business. Most of the $2 billion disbursed over the 16-year period studied came from sectors that would be highly impacted by climate legislation, and the timing of expenditures generally correlated with the potential for enacting climate legislation. 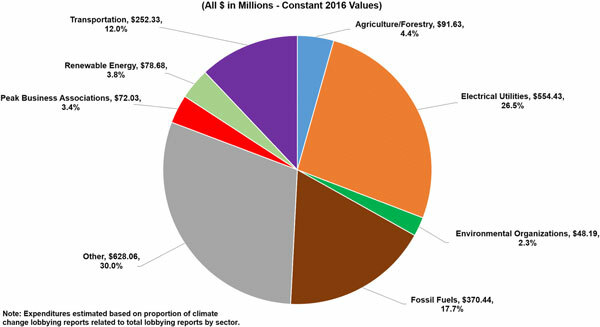 Spending by sectors engaged in the supply and use of fossil fuels dwarfed spending by environmental organizations and the renewable energy sector by a factor of 10. And don’t forget. These are conservative estimates. Thanks for stopping by.